Hey, if you shoot enough photos of old cars on the streets of Alameda, sooner or later you'll get a shot that looks something like a Robert Bechtle painting! The photo above made me almost happy enough to forget my frustration that there's a super-original, 4-speed-equipped '68 AMX parked a couple doors down from this Comet... in a driveway, and thus off-limits to DOTS. The pain! And believe me, Alameda has plenty of DOTSworthy cars parked tantalizingly out of reach in driveways. Say, this Volvo Bertone, not to mention a 50s Land Rover, several Barracudas, a showroom-condition big-block '65 Impala, and... well, you get the idea. But never mind that- let's look at this fairly solid Comet, which is fair game for the roving DOTS camera! Charles Bukowski drove a Comet, though his was a few years older than this one. Still, that bestows some literary cachet upon the little Mercury. 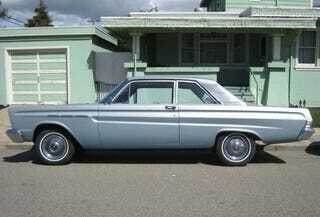 The '65 Comet 202 2-door listed at $2,108, which was $131 more than the mechanically identical 2-door Ford Falcon. What were you paying for when you got the Merc? Well, mostly you got a nameplate with more status than Henry's surname. But you also got some handsome styling touches, such as these taillights. Not only did you get snazzified styling when you got Mercury's version of the Falcon, you got images of the Roman god of profit all over the car!